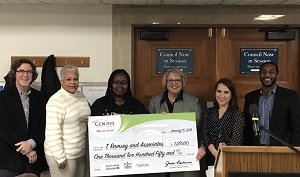 (Pontiac), Mich. – Jan 29, 2019 – Genisys Credit Union recently presented T. Ramsey and Associates a Spirit of Main Street Micro Business Grant. Genisys has partnered with the Oakland County Main Street Program to provide grants that will provide support to newer, small businesses and in turn create stronger downtown communities. T. Ramsey and Associates is a consulting firm located in Pontiac that strives to help companies be more effective through strategic planning, training and coaching. They have a strong commitment to the community and believe that helping local businesses succeed will improve the community as a whole. They are the first Pontiac business to be awarded this grant and will use the funds to make upgrades to their office space so they can better serve their clients.